I was looking out for a new watch, myself.. a simple, timeless, men's style watch.. but then I realized that I had 2 watches, one of which was kind of small (small watch face) but could fit the bill. After the 2 watches are done, I'll consider buying a watch. A really nice one this time. I have an MK Small Layton in gold and absolutely love it. I love those coppery gold ones! I like the Kelsey one! Great picks! Great post! I especially love number 6! I'm loving the 3rd and 5th watch. I don't have a watch but I have been seeing these chunky watches in the blog world lately. I definitely want one now! I love the M Kors watch! A great watch can always be in style. I have been eying a M kors watch for awhile but just just havent take the plunge to get it yet. I love the ones you have, I was never into big watches until lately. happy weekend! I love any big chunky watch. 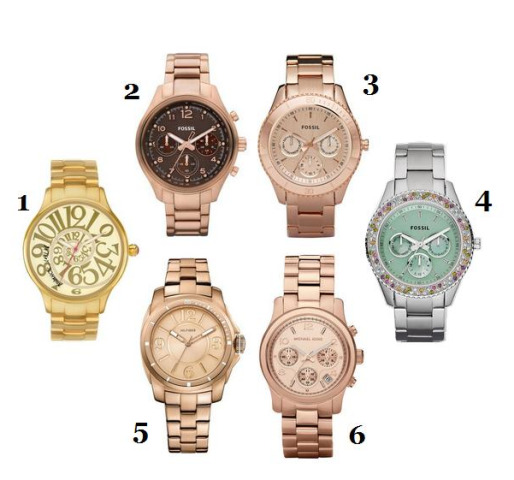 My favorites (and the ones I wear repeatedly) is a silver one from American Eagle and a rose gold one from Target. I'd love to have a Michael Kors one someday though. I like your style in watches! I have a Fossil watch which is sort of white shell, but similar style to that rose gold Fossil above.. great post! I have a gold Marc Jacobs one and I absolutely love it!